Beneficial insects can help us in the garden in a number of ways, either by dining on plant pests directly ("predators"), or by laying eggs in their larvae ("parasites"). Other beneficials help by pollinating the flowers that turn into our squash, peppers, cucumbers and many other "fruiting" crops. And a few wild species of bees also eat plant pests, not just nectar. Whether a bug is a "plant pest" or a "beneficial insect" requires a human perspective - a bug either helps or hinders us in our efforts to grow a vegetable garden. But from nature's perspective, the ideal is really a balance which includes both predator and prey insects. It is this balance we are going for in a healthy vegetable garden, not a predominance of one over the other. Habitat Make sure there is leaf litter or very loose mulch nearby for shelter from rain and hot sun. Or, provide a beneficial bug house, which is beautiful as well as useful. Food There need to be at least a few "pests" around for beneficials to eat, and parasitic wasps also need flowers for the nectar and pollen they provide. This means don't use pesticides that wipe out everything. Water A shallow pan or birdbath with pebbles (so insects don't get caught and drown) will attract beneficials, including bees. As water evaporates, it concentrates dissolved minerals, which are much needed by insects. A non-toxic environment Do not use chemical insecticides in your garden. If you have a pest infestation, use natural insecticides such as neem oil, or others listed in the plant pests article, while taking time to implement the other suggestions in this list over time. Small-petaled flowers Grow a variety of these, such as allysum, yarrow, cilantro, culinary sage, nepeta, etc. 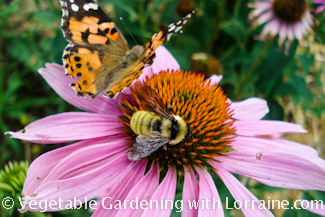 around the garden as nectar and pollen food sources. This will also confuse pests. 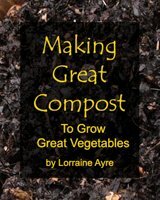 Diverse environment Interplant your garden beds, combining lettuces with spinach, tomatoes with carrots, etc. Avoid big patches of one thing (except corn, which needs a big patch for good pollination.) Interplant flowers among the vegetables, especially dwarf marigolds whose strong smell repels and confuses many insects (besides making our gardens more photogenic). There are too many beneficial insects for me to provide an exhaustive list, but here is a table showing a few of the most common ones, and what they either eat or parasitize. For color pictures and an encyclopedic reference to beneficial insects, you can't beat the UC Davis website, which has wonderful photographs and details of a huge variety of beneficials and what they help control. They also have a free color poster you can download and print with pictures of some of the more common beneficials. Most people don't think of paper wasps or yellow jackets when they think about beneficials, but they actually are very helpful because they eat a number of damaging insect pests including cabbage loopers and other caterpillars. With pots of flowers and herbs here and there. And saucers of water and pebbles. And a brush pile against the fence. And bird baths. And catnip left growing wild because Angel and Nikki like to roll in it. You get the picture. Go wild (at least little)! is perfect for attracting beneficial insects, which need a water supply. Add small pebbles so they don't drown. The best mosquito control there is! A single bat can eat 1000 mosquitoes in an hour. No danger to beneficials, since bats fly at night. provides a home for mason bees, lacewings, and ladybugs. Looks great in the garden! really does work to attract mason bees and other native pollinators to your garden.